See also: Pupil Assignment Act. Swann v. Charlotte-Mecklenburg Board of Education, argued before the U.S. Supreme Court in 1971, established court-ordered busing of students as a constitutional means of desegregating public schools. The case originated in the combined Charlotte-Mecklenburg County school system in 1965, when attorney Julius L. Chambers filed suit on behalf of ten pairs of African American parents. The lawsuit, named for six-year-old James E. Swann, contended that the school board's pupil assignment plan-still largely racially based-was insufficient to eliminate the inequalities of the formerly segregated system. Under pressure from the plaintiffs and the U.S. Office of Education, the school board formulated a new plan for the coming year based on geographic attendance zones for all but 10 schools and pledged to make assignments entirely on a geographic basis by 1967-68. Both the U.S. District Court and the Fourth Circuit Court of Appeals upheld the proposal. By many measures, the school board's plan was a success, for in 1968 only two urban school districts in the entire country (San Francisco and Toledo) were more desegregated than Charlotte-Mecklenburg. Despite this apparent achievement, the plaintiffs sought to reopen the case, charging that the community, because of various forms of governmentally sanctioned discrimination, was one of the most residentially segregated in the nation and that only through extensive busing could the schools reach the level of desegregation required by law. Federal district court judge James B. McMillan accepted this argument and in April 1969 concluded that there still existed an illegal system of schools identifiable by race. McMillan directed the school board to develop a new plan that met his criteria for racially neutral schools. In February 1970 he accepted, with minor changes, the board's plan for desegregating the secondary schools of Charlotte and Mecklenburg County through busing. The board had refused to consider a similar degree of busing for the lower grades, however, and McMillan approved a plan for the elementary schools, prepared by a Rhode Island consultant, that required substantial busing as the only means to eliminate all predominately African American schools. In May the Fourth Circuit Court of Appeals affirmed McMillan's order relating to junior and senior high schools but instructed him to review his requirements for elementary schools according to a test of "reasonableness." The school board and McMillan were unable to agree on an alternative plan, and in September the consultant's plan was implemented with the busing of approximately 43,000 students, more than double the number bused the previous year. In the meantime, the school board and the plaintiffs appealed to the U.S. Supreme Court. Although Chief Justice Warren Burger initially attempted to persuade his colleagues to reverse McMillan, the high court delivered its unanimous opinion upholding the judge on 20 Apr. 1971. Even this decision did not immediately end the case, as McMillan and the school board continued to disagree over annual adjustments to the pupil assignment plan. Not until July 1975 was McMillan satisfied that the burden of busing was sufficiently distributed between the races and within the white community to end his supervision of the school system and close the case. At first the effort to desegregate the Charlotte-Mecklenburg schools divided the races and provoked significant unrest, but in time many residents began to take pride in their relatively peaceful and successful adjustment to new social relationships. In 1974 students from West Charlotte High School invited their peers from the embattled Boston public schools to observe how Charlotte had dealt with the challenge of integration; some observers have linked the city's growth and prosperity in the 1980s to the school board's continued commitment to fully integrated schools. The case also showed African Americans and middle-income whites that they too could influence the political process, and in 1977 a biracial coalition won a referendum to replace the long-standing practice of at-large city council elections with a system based on representation by districts. The debate over the extent and value of busing continues, however, and in the early 1990s specialized magnet schools in inner-city neighborhoods were introduced as a partial alternative to busing. Frye Gaillard, The Dream Long Deferred (1988). Bernard Schwartz, Swann's Way: The School Busing Case and the Supreme Court (1986). "Swann v. Charlotte-Mecklenburg Board of Education." Encyclopædia Britannica. http://www.britannica.com/EBchecked/topic/973269/Swann-v-Charlotte-Mecklenburg-Board-of-Education (accessed December 4, 2012). "Swann v. Charlotte-Mecklenburg Board of Education (No. 281)." Legal Information Institute, Cornell University Law School. http://www.law.cornell.edu/supct/html/historics/USSC_CR_0402_0001_ZS.html (accessed December 4, 2012). "SWANN v. CHARLOTTE-MECKLENBURG BD. OF ED." The Oyez Project at IIT Chicago-Kent College of Law http://www.oyez.org/cases/1970-1979/1970/1970_281 (accessed December 4, 2012). Citizenplastic. "Julius Chambers at a program on civil rights protests at the Sonja Haynes Stone Center for Black History and Culture at the University of North Carolina at Chapel Hill." Chapel Hill, N.C. February 13, 2007. Wikimedia Commons. 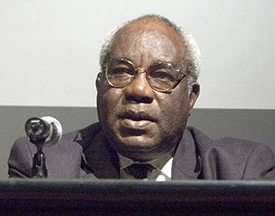 http://commons.wikimedia.org/wiki/File:Julius_Chambers.jpg (accessed December 4, 2012).